Atletico Madrid needs a win at Camp Nou to keep their slim title hopes alive as Barcelona currently enjoy an eight-point lead over their closest rivals. Despite Barcelona not enjoying the best of seasons in Spanish football in terms of their style of play and inconsistency they still look miles ahead of the pack. A win for them will all but guarantee yet another La Liga title with very few games left in the La Liga. With an eye on a trip to Old Trafford next, Barcelona knows they have a very important phase of the season coming up. Barcelona vs Atlético Madrid - Live Football Score. Ousmane Dembele has begun light training but still remains unsure of when a possible return to the first team is possible. Arturo Vidal is suspended for the contest after accumulating several yellow cards which means Arthur will likely partner Sergio Busquets and Ivan Rakitic in the Barcelona midfield. All eyes will be on their talisman Lionel Messi who has the ability to change the dynamics of any game with his talent. He will want his defence to rock solid though and do not repeat the mistakes of last game. With Diego Costa and Alvaro Morata both missing through injuries, Angel Correa will partner Antoine Griezmann in the Madrid strike department. Thomas Lemar is also absent opening up an opportunity for Koke. Key man in midfield for Atletico Madrid is Thomas Partey who has been linked with Manchester United due to a string of solid performances. Jan Oblak in goal can expect a busy evening with Messi and Suarez peppering his goal with shots. A draw looks the most probable result which is only going to benefit the home team in their quest for La Liga glory. 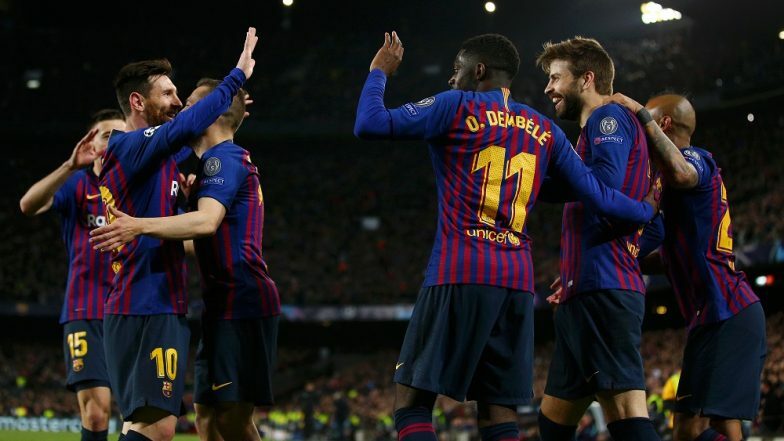 When is Barcelona vs Atletico Madrid, La Liga 2018-19 Football Match Schedule (Date, Time and Venue Details)? Barcelona and Atletico Madrid horns against each other in the La Liga match on April 07, 2019 on Saturday mid-night. The Barcelona vs Atletico Madrid football match will be held at the Camp Nou. It will kick off at 00:15 AM IST. How to Watch Live Telecast of Barcelona vs Atletico Madrid, La Liga 2018-19 Football Match? Sony Pictures Networks holds the broadcast rights of La Liga in India. So, the Barcelona vs Atletico Madrid match will be live telecast on Sony Six and Sony Six HD channels. If you are unable to watch the match live on their TV sets, you can catch Barcelona vs Atletico Madrid match online via live streaming on Sony Liv app as well as on La Liga’s official Facebook page. You can also live football score updates on LatestLY here.